I’ve begun the Great Pattern Revamp of 2007 in an attempt to make some of my old patterns not look like they were written by a new knitter, which of course they were. #1 on the list was the Felted Knitting Tote, prompted by some questions that were emailed to me this morning, embarrassing me thoroughly. Aw, the memories. I only wish I still had the bag so I could take a decent photo! And oh, how I wish it wasn’t too late to change the name of that pattern. I used the word “felted” incorrectly on purpose, because it was, by then, the term that was popular in certain circles to describe fulling. I wanted the pattern to show up on internet searches, and boy, does it ever. I still regret it. Knitting has had to stop on the Fantom Bohus because I need to spin more yarn. It’s making me anxious, despite the pleasure of spinning that gorgeous wool/alpaca blend, so planning of the next project has begun. Mark (Mr. HelloYarn) went with me to the Circles moving sale last weekend and helped me empty the store. It turns out he’s as helpless in the face of sale Rowan as I am. 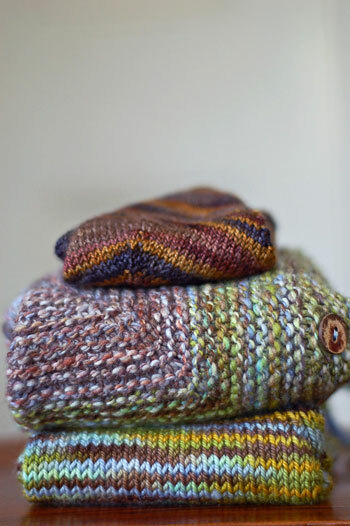 He silently pointed at the shelf of Rowan Scottish Tweed Aran in Thatch (color 018) and 10 skeins were purchased. He was also very fond of these buffalo nickel buttons. So, a new project is in the works- the Saddle Shoulder Aran Cardigan by Elizabeth Zimmermann/Meg Swansen from Wool Gathering #63. Yoohoo over there made one a little while ago and when shown about 975 sweater photos yesterday, Mark chose this one. He has good taste. All washed and dried and smelling delicious, off to baby. Those buttons make me think of my mom, she seemed to have an endless supply of buffalo nickels. And dood, THOSE BUTTONS ARE FANTASTIC (yes, that deserved caps). Thanks for that link, there’s some very interesting material there! I thought at first she was saying you could eat wool in a pinch but then I realized she meant the sheep. Doh! 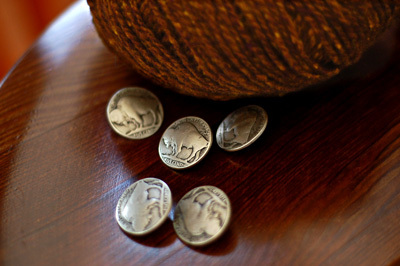 Buffalo nickel buttons. Now you’re talking. I’m from Buffalo! Couldn’t you change the name of the felted bag pattern anyway? You’re the boss. I say change it! Those buttons are awesome, and Mr. Hello Yarn picked a great sweater. It’s in my list of sweaters to make for Mr. Bea Knits, along with the Adult Tomten :P Whoever is getting those baby gifts is so lucky! They turned out beautifully. Yeah. That Thatch color is unreal. Can’t wait to see that! What a lucky guy! That will be a fabulous sweater. Lucky Mr. Helloyarn! He’s got good taste in yarn, buttons and patterns! Good score on the yarn AND the button. Those are way cool. Who gets them, you or him? Oh, KellySue will be so happy! Mark has good taste indeed! Love the buttons – I bought a card of those about five years ago, and haven’t used them yet – I just love having them! :) Also: mmm, Rowan. That sweater is going to be sickly beautifully awesome in that yarn! And also, I want the buttons. That picture takes me back. Your bag was my first big knitting project, finished it in about a month and washed it twice. It now sits on my bookshelf loaded up with hairy Icelandic yarn just waiting to be knit. It brought a little smile to my face today to see it again. Cheers.